The Oak View Group says its renovation proposal can proceed without NBA or NHL teams for now because of the concert revenue its Live Nation deal would provide. The partnership also is exploring an “extended residency’’ deal with legendary rock band Pearl Jam. A major music and equity partnership with Live Nation is what’s allowing one of the two KeyArena renovation groups to proceed without first landing teams. The Los Angeles-based Oak View Group (OVG) lacks the sheer financial staying power of the partnership between rival Anschutz Entertainment Group and real-estate giant Hudson Pacific Properties. But OVG says its $564 million renovation proposal can nonetheless proceed without NBA or NHL teams for now because of the concert revenue its Live Nation deal would provide. • OVG: Tim Leiweke sat on NHL executive committee and has been president of the Toronto Maple Leafs and Los Angeles Kings. Got his start working for the St. Louis Blues as an executive. Half the NHL’s 30 teams are part of OVG’s arena alliance, and Florida Panthers executive chairman Peter Luukko is co-chairman of that arena alliance — a marketing, sponsorship and consulting arrangement. OVG also has KeyArena concessions deal with Boston Bruins owner Jeremy Jacobs, chairman of the NHL’s board of governors. • SP: AEG owns the Los Angeles Kings and has either built or managed numerous NHL arenas, including T-Mobile Arena in Las Vegas, Barclay’s Center in Brooklyn and Gila River Arena in Glendale, Ariz. Hudson Pacific Properties is owned by Victor Coleman, who is known to the league after he expressed interest in bringing an NHL expansion franchise to Seattle in 2014 and 2015 to play at the envisioned Sodo District site pitched by Chris Hansen. • OVG: Tim Leiweke is a former president of the Toronto Raptors and oversaw AEG operations at the Staples Center in Los Angeles, home of the Lakers. He owned a 4 percent equity stake in AEG, which was a Lakers part-owner. • SP: AEG is part-owner of the Los Angeles Lakers and has built and managed multiple NBA facilities, including the Staples Center in Los Angeles, AmericanAirlines Arena in Miami and AT&T Center in San Antonio. Beyond a regular stable of shows provided by the world’s largest concert promotions company, the partnership has begun exploring an “extended residency’’ deal with legendary rock band Pearl Jam that would see it play multiple KeyArena shows on a regular basis, much like Billy Joel does at Madison Square Garden in New York. Pearl Jam manager Kelly Curtis has been added to an OVG advisory board exploring how to improve KeyArena’s acoustics and overall concert experience. 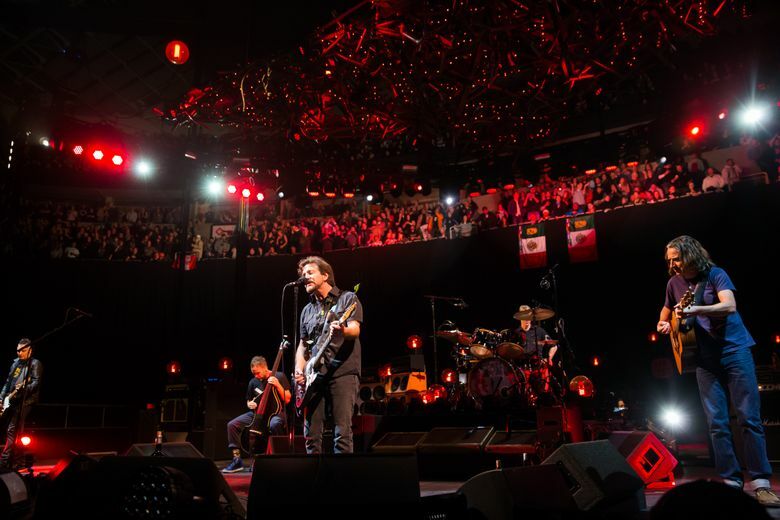 The Pearl Jam inclusion resulted from a meeting between the band and top OVG officials at the Rock and Roll Hall of Fame induction ceremony last week at Barclay’s Center in Brooklyn. Among the OVG members conversing with Pearl Jam was OVG co-founder and legendary music manager Irving Azoff and Madison Square Garden (MSG) chairman James Dolan — OVG’s main financial backer. The group also mentioned it loved the acoustics at Dolan’s renovated MSG. It also discussed loving the MSG-renovated Forum in Inglewood, Calif., telling them: “We loved that, do that in Seattle,’’ Leiweke said, relaying the conversation. Leiweke added that Dolan and Azoff told the band they planned to do exactly that with their KeyArena remodel. Leiweke said Pearl Jam initially asked if the KeyArena remodel could be for music only, but they were told no, that it would be for music and sports just like MSG. “So Kelly Curtis, the manager, agreed to serve on the advisory board and help us make it the perfect music experience,’’ Leiweke said. “And the band … would love to do an extended residency kind of idea because they still believe Seattle is their home city. The development is interesting, given that new OVG partner Live Nation merged with Ticketmaster in 2010. Pearl Jam had a well-known, longstanding feud with Ticketmaster dating to the 1990s over service fees the ticketing firm piled on to concert tickets. He said the huge amount of money his group is spending on the remodel can’t be recouped long term via only music.